As many of you know, my next cookbook will involve RHUBARB. It’s a good thing I love rhubarb because I have been testing rhubarb recipes pretty much nonstop for the past month; I would tire of almost any other food if I had to cook with it that intensely. Fortunately, I’m still enjoying the rhubarb. This recipe is adapted from one I found on the Wisconsin Cheese website, maintained by the Wisconsin Milk Marketing Board. I have fond memories of spending a couple of early summers in Wisconsin with my family when my father was working on his doctoral dissertation at the University of Wisconsin at Madison. In June we feasted on three of my favorite foods—rhubarb, asparagus, and cheese. I loved visiting the university’s dairy bar and trying various flavors of ice cream. (I’m not sure whether this eatery still exists, but I hope so; all I could find online was the agriculture department’s store, which still looks pretty terrific.). I recall—whether this is an accurate recollection or not, I couldn’t say—that milk flowed from the water fountains there. Small-child heaven! The original compote recipe included spices, but I prefer just a few fresh herbs to let the flavors of the bacon, rhubarb, and onion shine. This compote is best eaten after it has chilled completely. It makes a delightful sweet-and-savory accompaniment to cheddar or Swiss cheese on crackers or toast. When I made it, I used local bacon from a smokehouse near my home, Pekarski’s in South Deerfield, Massachusetts. The bacon flavor really dominates here so I urge you to use the best bacon you can find. You only need four slices so you won’t break the bank! 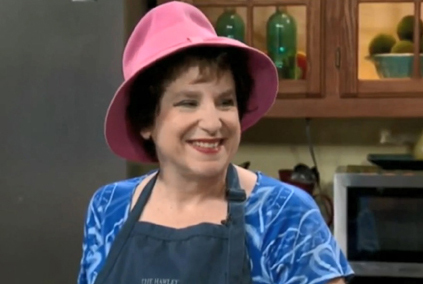 I thought a pink hat would accessorize rhubarb nicely. Fry the bacon in small pieces. Add the onion, and cook over low heat, stirring occasionally, for about 15 minutes, until the onion starts to caramelize, stirring frequently. Add the rhubarb, the vinegar, and the maple syrup. Continue to cook, stirring occasionally, until the rhubarb softens and most of the liquid evaporates. The timing on this stage will vary depending on the toughness of your rhubarb. 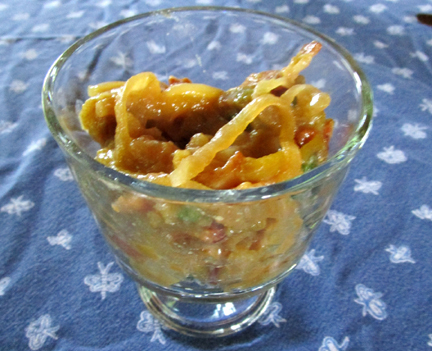 When I made the compote, breaking down the rhubarb took about 10 minutes. Remove from heat and cool to room temperature. Stir in the herbs, and refrigerate until ready to use. Serve with cheese. This entry was posted on Monday, June 19th, 2017 at 4:00 am	and is filed under Appetizers, Rhubarb. You can follow any responses to this entry through the RSS 2.0 feed. You can leave a response, or trackback from your own site. Rhubarb-bacon compost, eh?? Sounds, delish! LOL!! It really, truly IS, Donna. Old English was compost. From the French. Also when French loses an “S” it usually puts a circumflex accent on the vowel before. I knew there was a reason I liked the word compost! Of course, when I say “compote” I’m saying it in English … do I don’t THINK I need the circumflex. Thanks for the linguistics lesson, Nick!